I had a week-long holiday and decided to work on a few sewing projects: a backpack, and Sansa's direwolf dress from Season 6 of "Game of Thrones". 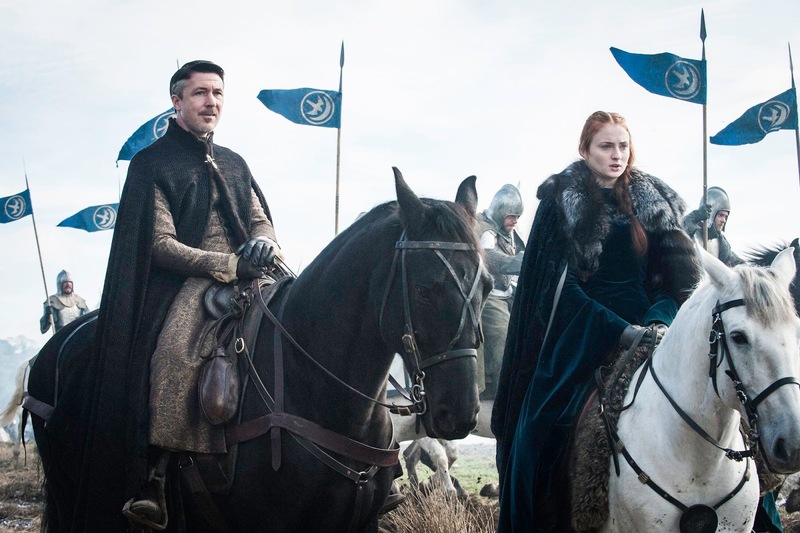 I love this costume, partly because it is beautiful yet deceptively simple, and partly because of how it shows Sansa's character development. 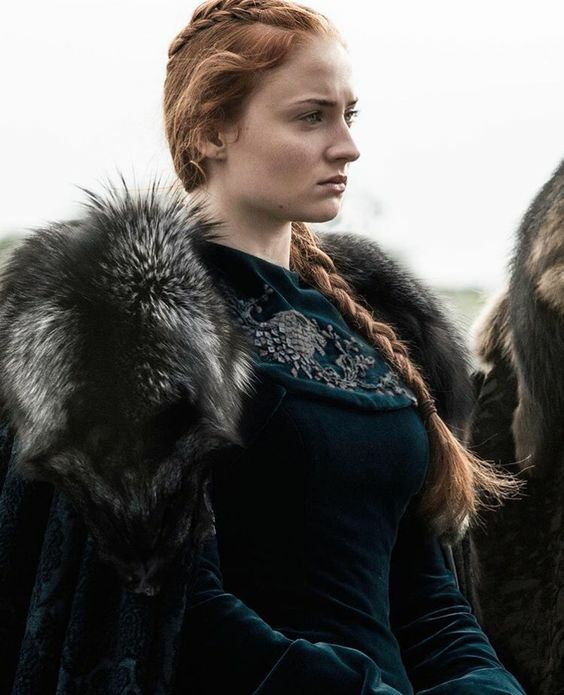 I happened to have a wig from The Five Wits that was ideal for this costume (http://www.thefivewitswigs.com/shop/wigs/lady-winter-sad-stark/), and a pattern that would work well for the base dress (McCall's M4491). 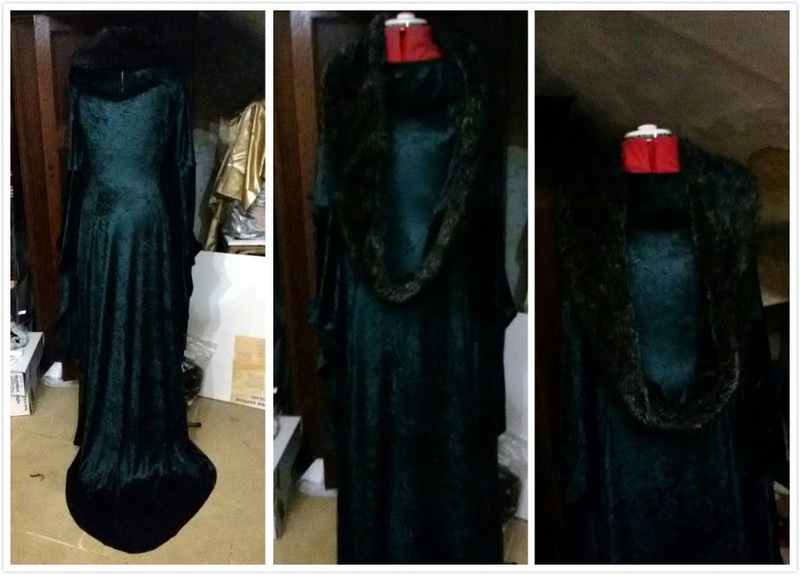 I found a stretch velvet in the costume section. 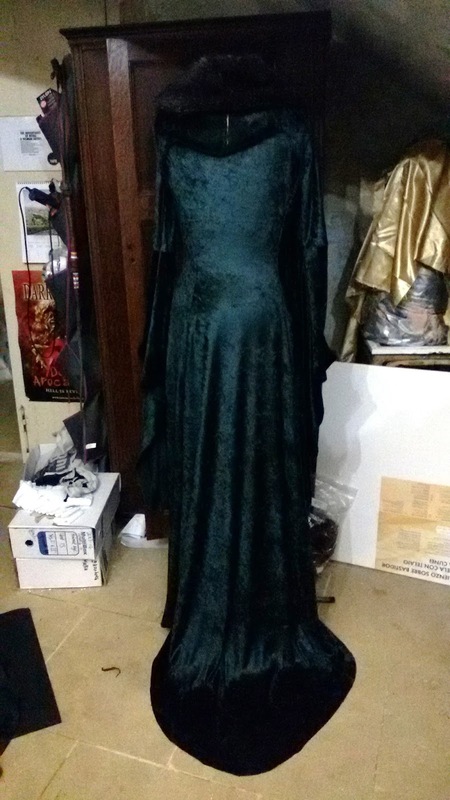 It isn't accurate: it's more dark green than teal, and has a subtle scale print. But I liked the colour and it was affordable. I bought 5 metres for about Euro 25.90. Side note, apologies for the photo quality. I used my phone, and the lighting wasn't very good. I started by laying out the material and cutting out all of the pieces. I altered the back piece to have a train. I ironed interfacing on to the seams to make it easier to sew, and sewed the front-side and back-side seams, leaving the side seams open. 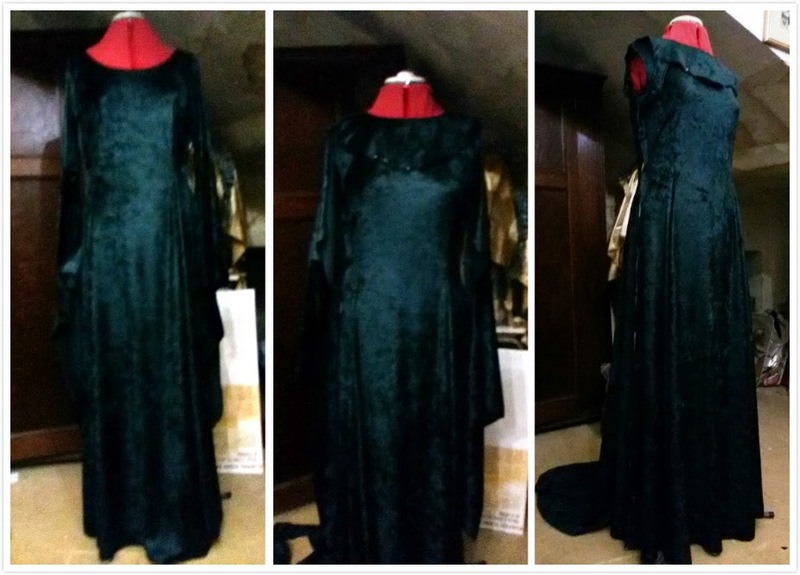 I finished the neckline using elastic because initially I wanted to pull the dress on over my head (though now I think I'll add a zip). Next I started making the bib. I patterned it by drawing the shape of the front piece, then using the McCall pattern to make straps that go under my arms. In hindsight, I think the bib might have looked a little better if it were slightly longer. The bib has a zip in the back, but honestly the zip looks really ugly. I'd prefer to add a seam to the back of the dress, tack the seams of the bib to it, and add a zip to close both of them. For now I think my plait will hide the zip. 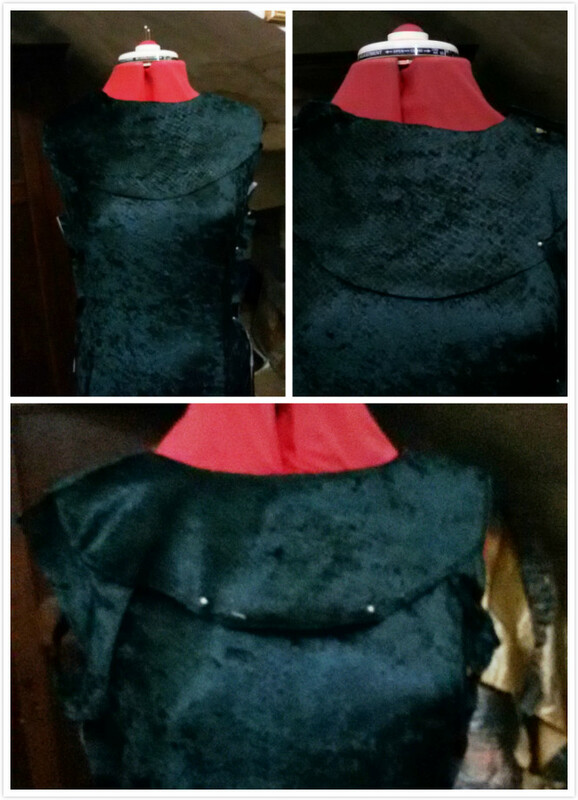 I sewed on the sleeves, and sewed up the side seams (I added a hidden side pocket on one side). 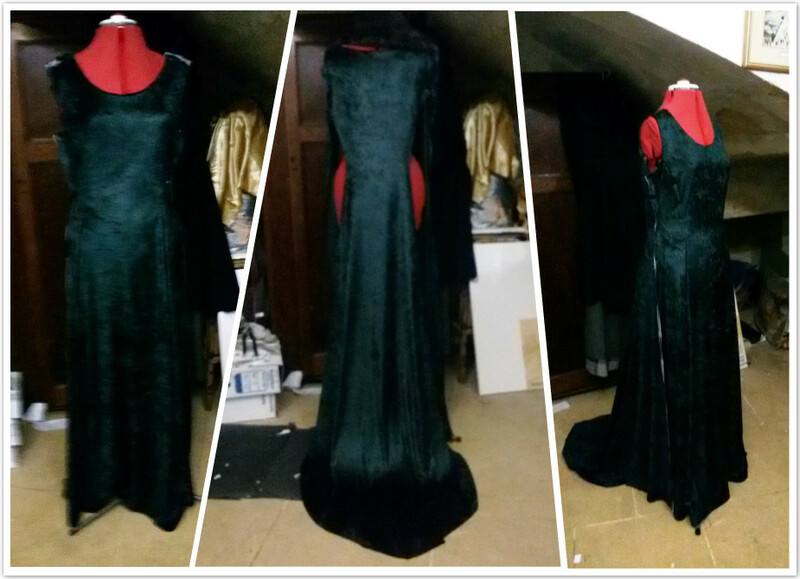 I had just enough time to hem the sleeves by hand. The dress still needs hemming, but I think I'll need someone to help me with that. I found the fur scarf in a thrift shop. 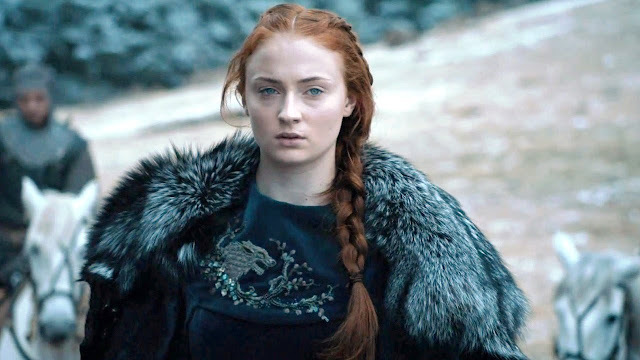 I need to open up the scarf and sew the sides to mimic Sansa's fox fur.